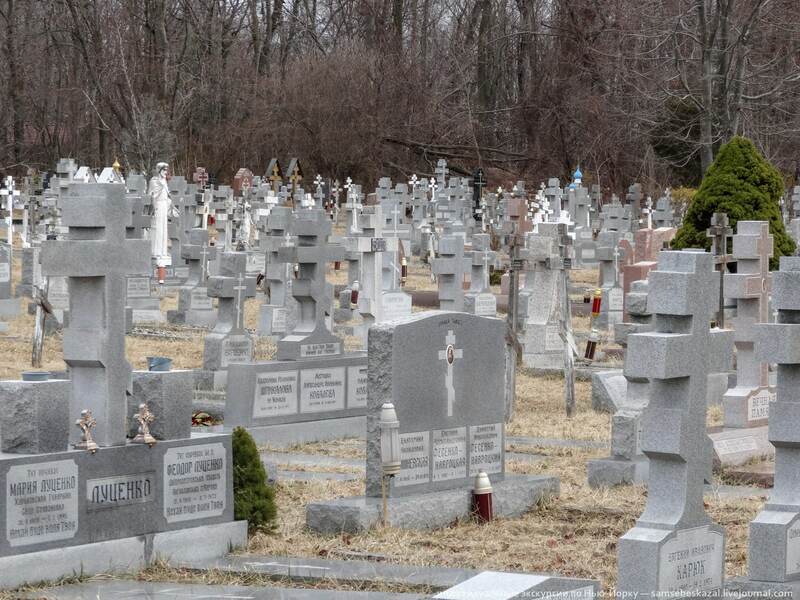 This graveyard is located in the state of new York, not far from the Big Apple. And the cemetery itself, and a monastery, which it is, without a doubt are one of the attractions of the state. The place is undeservedly overlooked and tourists and locals. Perhaps the fact that it is really difficult to reach by public transport. And on the taxi out expensive. But actually you just have to combine a taxi with metro — it will cheaply and quickly. 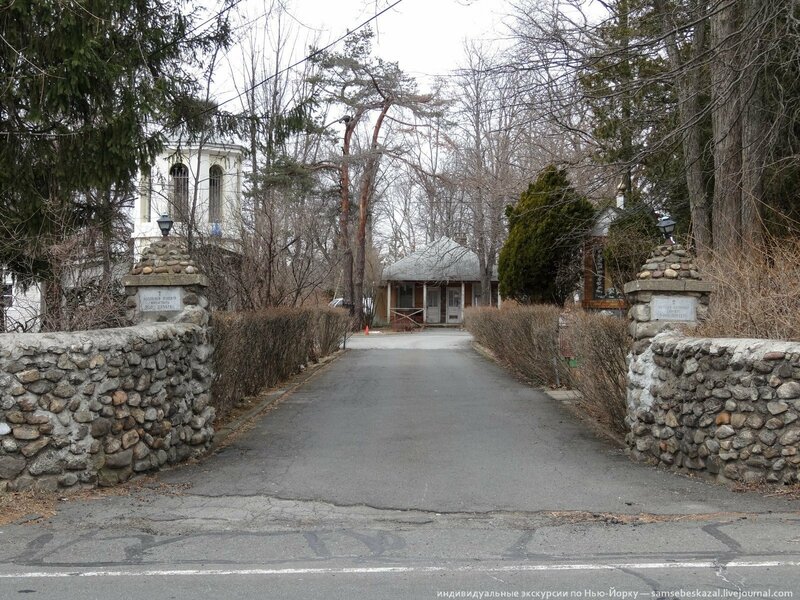 All the guidebooks as one, asserting that this area of Russia is located near the town Nanuet in the County of Rockland “just 30 miles North of new York.” In fact, if you have a car, it is the imaginary proximity to the city. No, you can get there by public transport, but it is better not to do it. Believe my experience. A couple of weeks ago, I checked it myself. First train reached the town called spring valley (Spring Valley), a small town in the North of the state. I often, when writing about such American towns around new York city, add the word “cute”. So “cute American town: a clean, comfortable and safe” — it’s not about that part of Spring Valley, near the railway station. No, it is by a little off and really start clean streets and rows of neatly trimmed lawns. However, in the vicinity of the station do not. It’s dirty, smells like pee, there’s the drunk townspeople and broken bottles of alcohol on the rails. Moreover, the trains in new York go out intermittently, for example every three hours. Again to the monastery from there walk almost three kilometers, plus the road goes and/or uphill, or on a busy winding road, where there is no sidewalk for pedestrians. To go I had to walk. Taxi near the station, but with very inflated prices. The Uber driver to find I could not program persistently sent him to a place where I wasn’t even close. In General, if you have a car, the best option to reach the monastery quickly, relatively inexpensively and safely, one to first drive to the 175 street station (A train), and from there take a taxi. Half an hour and you’re there. 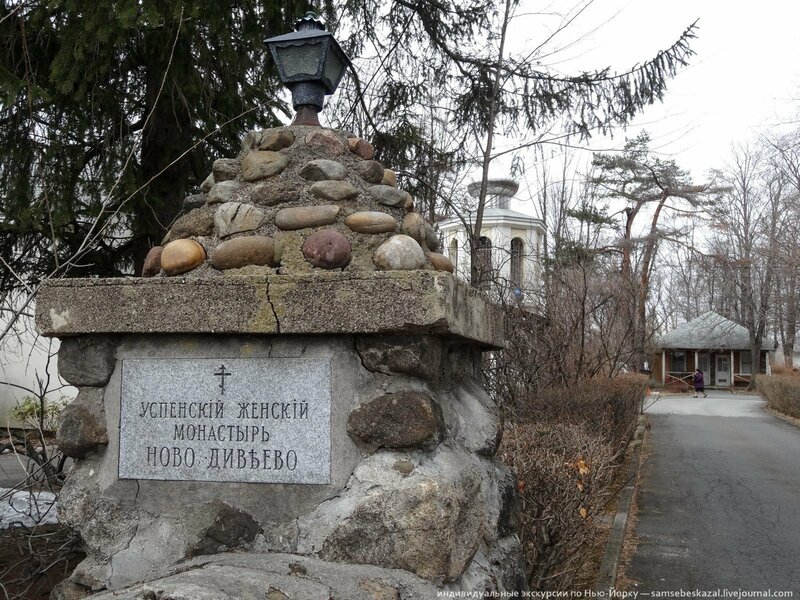 Novodiveevo convent was founded in 1949 by priest Adrian Rymarenko, a man of amazing destiny. 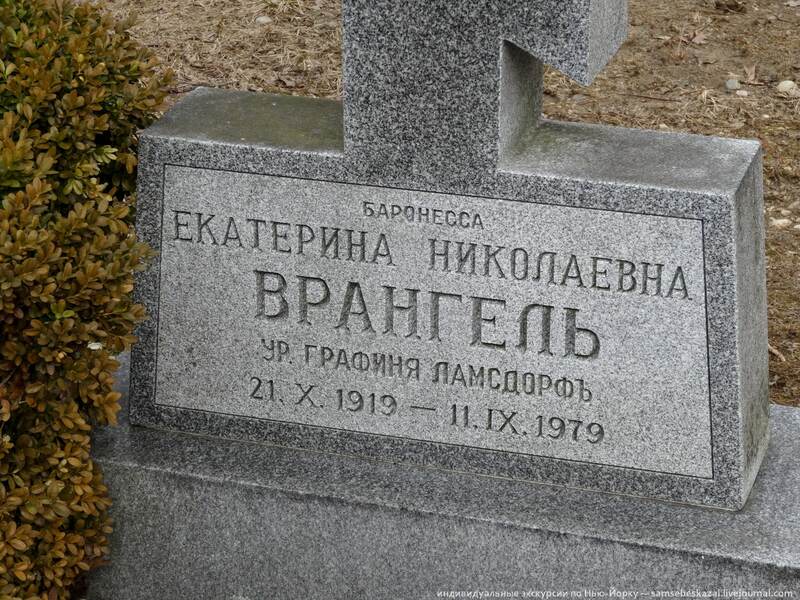 In 1917 he graduated from the St. Petersburg Polytechnic Institute, but in profession work and did not go — was so shocked by the revolution that went head first into a religion. 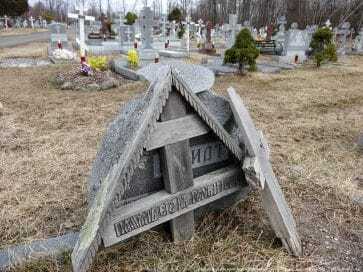 In the United States forced the priest fled immediately after the Second world war. The decision to establish an Orthodox monastery came to the priest immediately. However, funds were not available. However around Adrian Rymarenko gradually gathered congregation. For a long time to pray together, they used the former stall of the elephant. I lived in those parts a very wealthy man named Pierre Bernard. He kept an exotic animal, that has died and now his stall and gave it to the congregation. Nanuet as the site for the future monastery complex was chosen at random — here a few years empty manor house of a Catholic convent, which the Catholics were ready to sell for a small even for those times the sum — total of 30 000 dollars. However, with the condition that the new owner will not create bought it on the site anything that violates the sanctity of the place. The bulk of the funds for the purchase of donated American Charles Hawkins, the President of the First national Bank in spring valley. 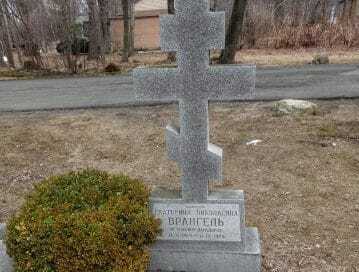 The missing $ 5,000 Andrian Rymarenko gave the elderly Russian-speaking immigrant male. He put that money aside for old age, but decided that the Church is more important, especially, he was invited to live out their days. 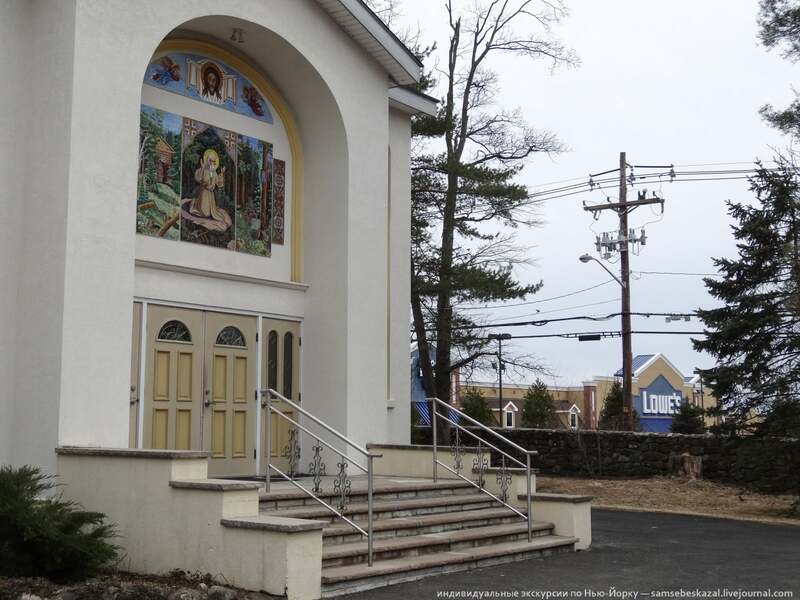 Four years after the place was purchased, where a new Church was built in the name of Reverend Seraphim of Sarov. 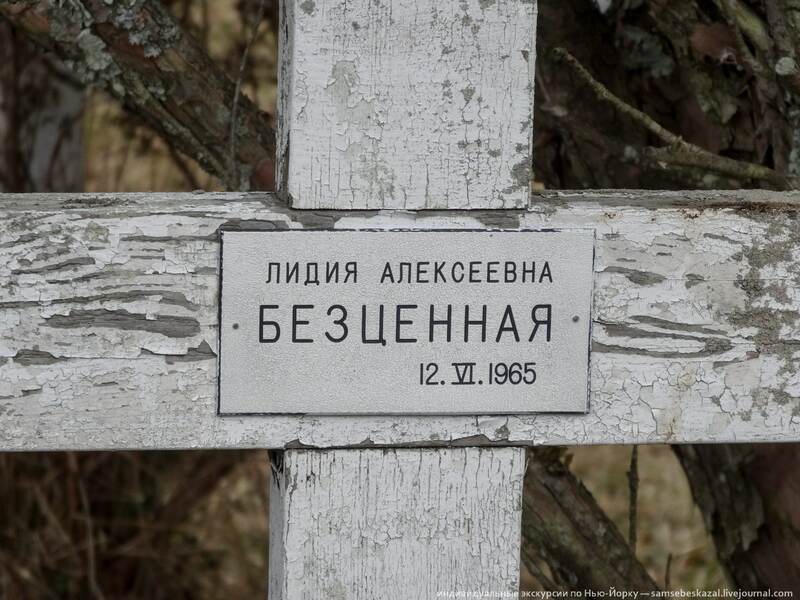 By the way, hence the name of the whole monastery complex in Russia St. Seraphim Diveyevo lived under. Because the United States and appeared stavropegic convent of the Russian Orthodox Church abroad — the New Diveyevo (Novo-Diveyevo). In 1972 there began to build a building for nursing home. Called it “Old people’s house of a Russian Orthodox convent “Novo-Diveevo””. 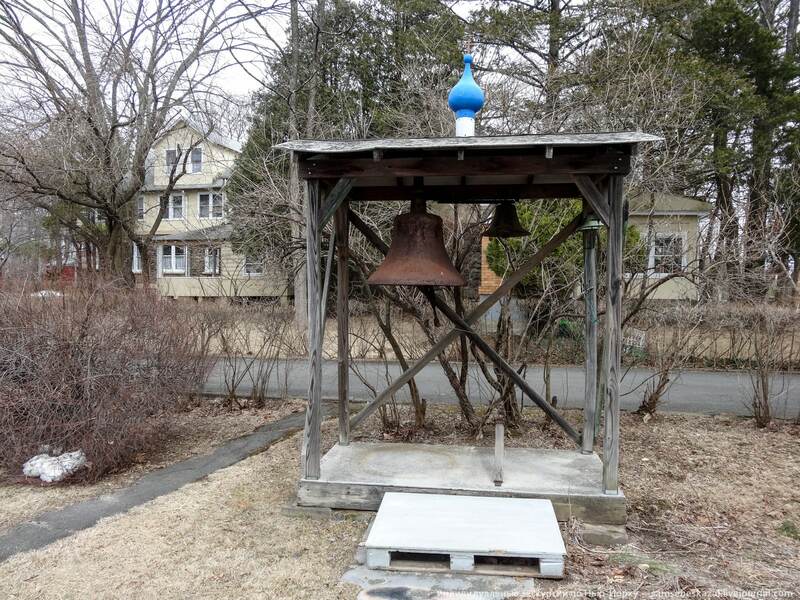 The purpose of its creation was to help the Russian-speaking immigrants who have not mastered English. There still available. Two buildings are never empty. Bishop Andrew was known as a very respected man. To communicate with him, came to U.S. President Richard Nixon, and the Governor of new York Nelson Rockefeller, and Alexander Solzhenitsyn, Mstislav Rostropovich and Galina Vishnevskaya, and many others. Every year the monastery was visited by up to 50 thousand pilgrims. 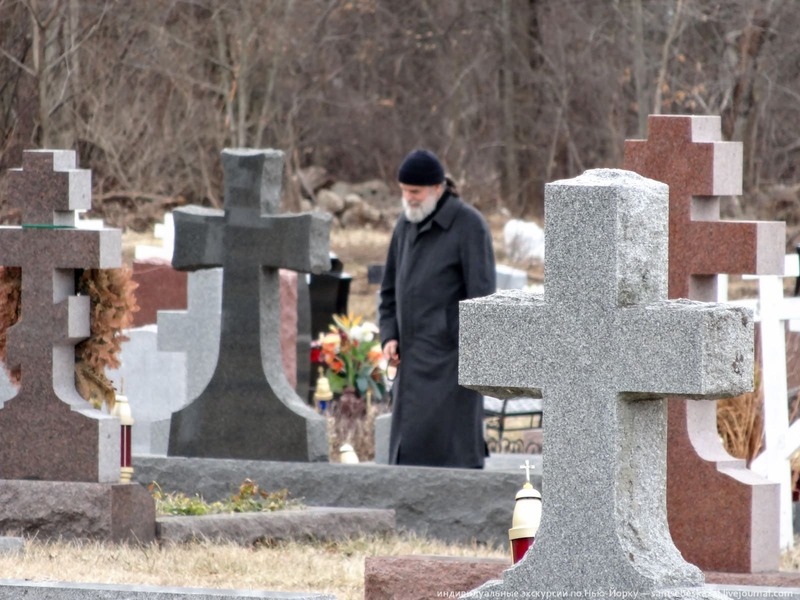 Today, when you see around the emptiness and loneliness, it is hard to believe — visitors now here’s a rarity… Although the Church is open, and the cemetery is less interesting over the years did not, rather the opposite. Perhaps the fact that over the years was introduced in the USA and other Orthodox churches. And now you don’t have to travel as far to worship the shrines, talk to a priest to perform some rituals. Iconostasis in the Church are modest. 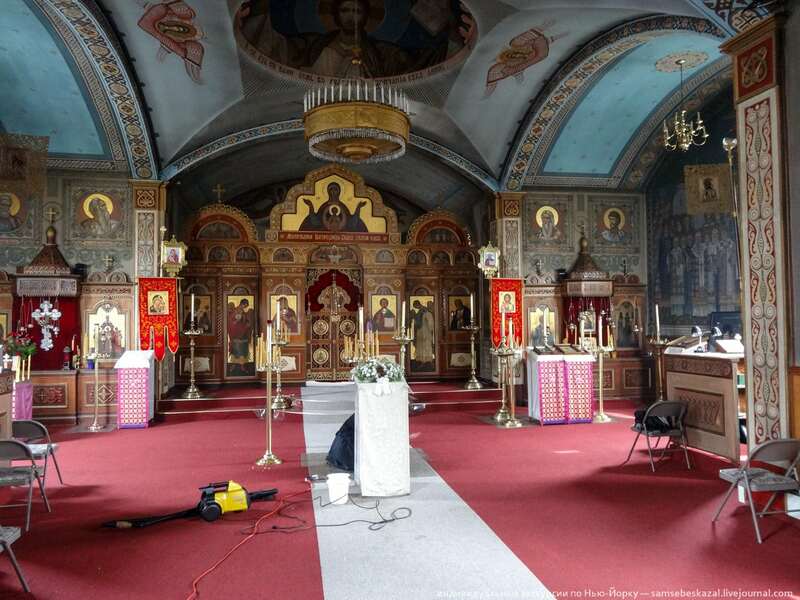 However, in the monastery Church of the assumption is kept removed from Serafimo-Diveevsky monastery icon of St. Seraphim of Sarov, which in 1903 was praying, the family of Nicholas II. After the revolution and subsequent closure of the monastery at Diveyevo, the icon was taken to Kiev, then, during the second world war, she came to Poland, from there to Berlin and then to the United States. In addition there is in the Church and other Orthodox churches — portrait of St. Seraphim of Sarov written during his lifetime, the icon of the Vladimir Mother of God, the cross from the Ipatiev house, the two images of the Savior, which belonged to Nicholas II and was with the Royal family in Tobolsk and Ekaterinburg. Shrines not specifically guards. The portrait is hanging free. Although the heyday of the monastery is long gone, but today there live nuns. This ten women of all ages, including very young. They all speak Russian. They follow a fairly extensive territory, take care of the graves and the Church. This place looks very well maintained, although it is noticeable that it is already battered by life here and there you can see the fallen from the time of stone crosses, wooden crypts cracked and desiccated, the office building is clearly in need of repair. Behind the fence of the monastery stands a brand new huge Mall, which is also, albeit unwittingly, but stressed that the monastery would not prevent major repairs. 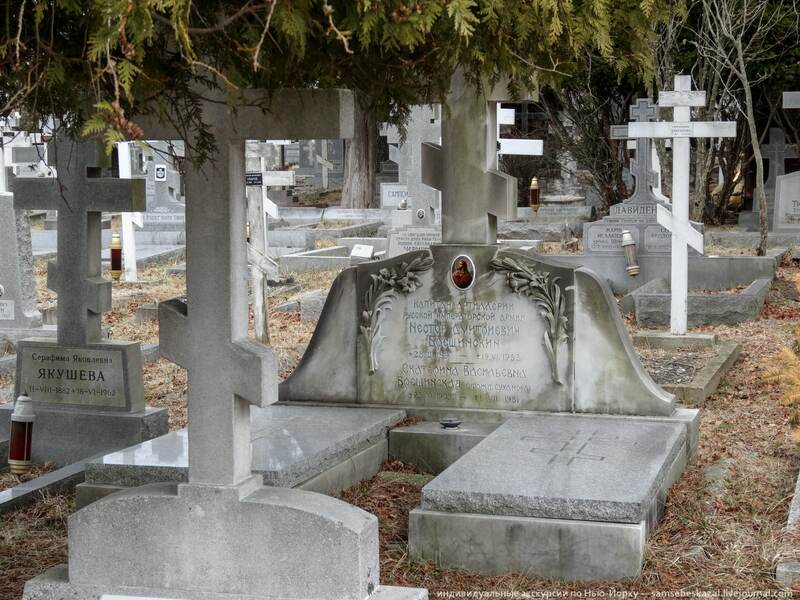 Despite this brilliant history of the emergence of the monastery, the main attraction of this place is the cemetery. It is informally divided into two parts — old and new, and begins just behind the monastery buildings. 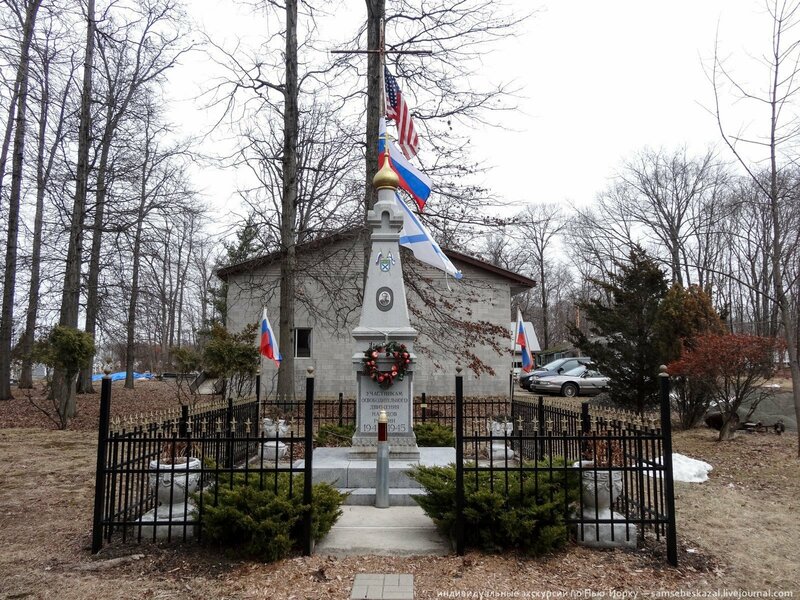 Here proudly rises the chapel dedicated to the soldiers of the Russian corps. Thus who never were citizens of the Soviet Union, however, struggled with the Soviet power as they could. For example, they swore allegiance to the Fuhrer and since then RK is a unit of the Wehrmacht and the ROA. By the end of the war, they openly fought against the Soviet army. The cross and the letters “RK” can be seen on many monuments, but it’s all in the old part of the cemetery, which is of historical interest. 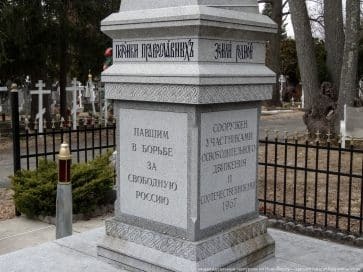 It is here found their final resting place to many famous and even eminent natives of the Russian Empire. 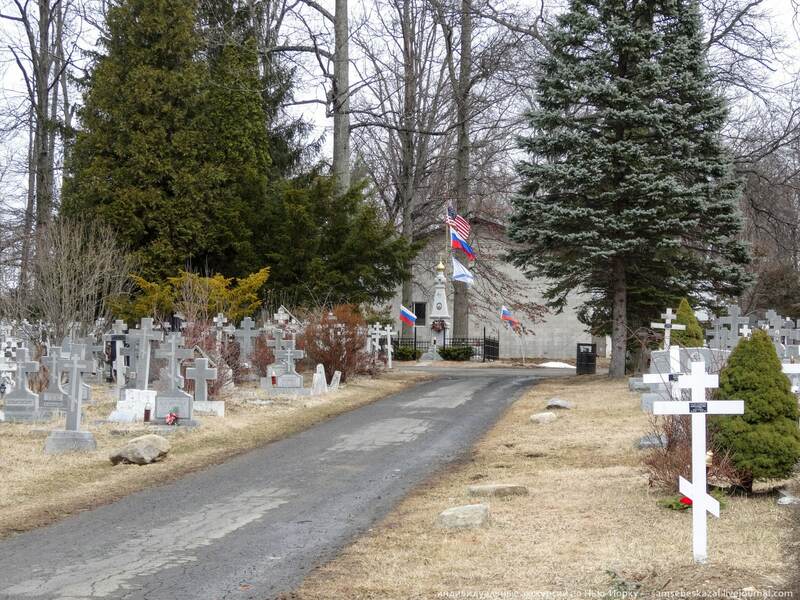 At present, there buried about 7,000 people: the princes, the generals, the clergy, the prominent representatives of Russian culture… This is the big “Russian” cemetery in the United States. 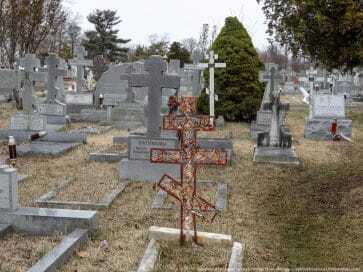 From the us it is very different — so many Orthodox crosses in the USA you will not see anywhere else. 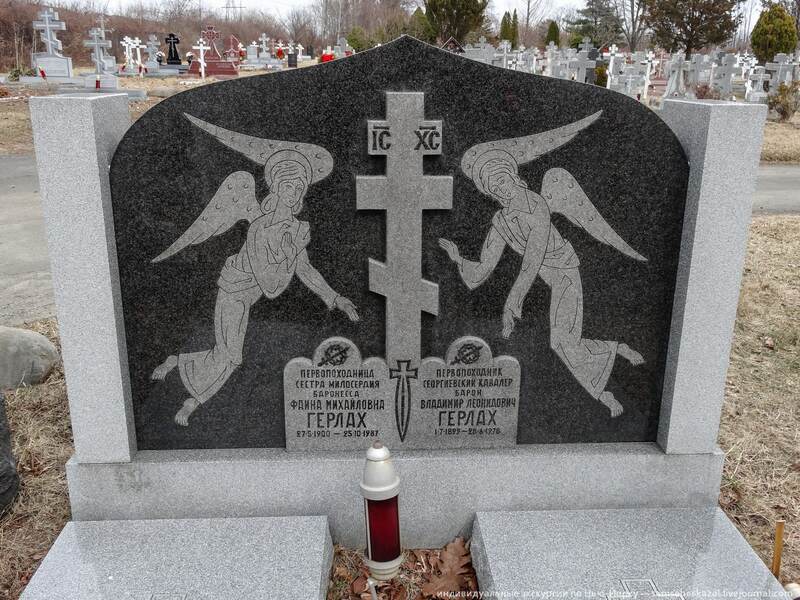 But typically Russian is not very similar — for example, there are practically no fences (the couple of graves), crosses are all the same, and on the gravestones there are almost no pictures (with rare exceptions). To be buried near the monastery began in the 50s of the last century. 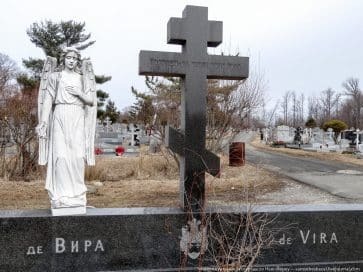 At some point the cemetery became so popular that it began to bring the deceased from France, Brazil, Morocco and other countries. 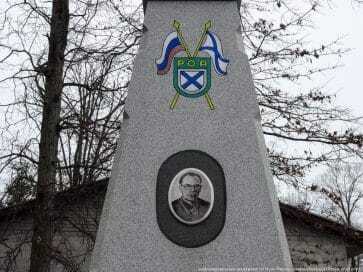 First here rest the whites, those who left Russia in November 1920 with the troops of Baron Wrangel. Such, then, was about 150 thousand. First they sailed to Turkey, and then began to disperse around the world, many got to the USA. 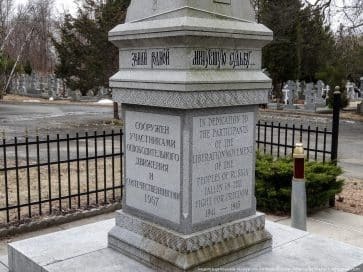 On the monuments very often the army ranks who are long gone, and the names of persons close to the Emperor — and Volkonsky, and musiny-Pushkin, Trubetskoy, and Gagarin, Lopukhins and by the Way… the wife, the daughter and the son of Wrangel is buried here too. The Baron’s son Peter all my life I worked as an engineer in the field of Aeronautics, engaged in the construction of spaceships to fly to the moon. The daughter of Baron Wrangell Elena — the last years of life and is held in the monastery. Friend near buddies there are even the graves of close relatives of Nicholas II — brother and sister of the Romanov, Prince Georgy and Princess Vera Konstantinovna, children of Grand Duke Konstantin Konstantinovich, a grandson of Emperor Nicholas I.
Vera Konstantinovna lived a long life, she was born in 1906 in 1918 he left Russia forever, Novodiveevo died in a nursing home in 2001. 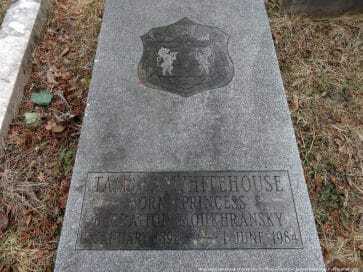 After her death, not a single representative of the Royal dynasty, born in Russia. Found here last shelter by Alexander Thick was the daughter of Leo Tolstoy, the one in the hands of which the writer died, and which he bequeathed to dispose of his work. The last child, beloved daughter. In the United States from the Soviet Union Alexandra Lvovna literally fled. Quickly settled in a new country and founded the “international Committee for relief to all the Russian people who need it.” This organization is financially supported many well-known immigrants, for example, the composer Sergei Rachmaninoff and aircraft designer Igor Sikorsky. 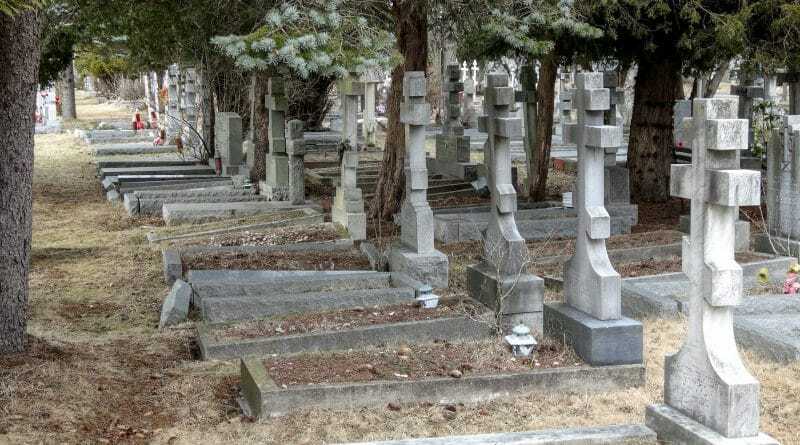 Do walk around this cemetery, it is necessary slowly, and then checking in Google what famous person buried here. Long obsolete “er” in words, professions, and more names, written in pre-revolutionary rules, for example, is Priceless — there is an interesting to every detail. Feeling that the time machine transported to pre-revolutionary Russia. Here rarely see the stove — increasingly crosses — Yes granite marble. Interesting detail — the simpler the monument over the grave, the smaller, the more significant the figure beneath it is. 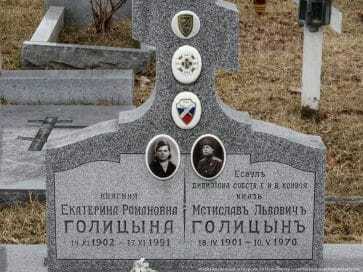 Old wooden tombstones rastreskivalis, some already and there are no inscriptions, where it reads “Eternal memory”. No, not eternal. Everything is destroyed, even the powerful stone tombs. 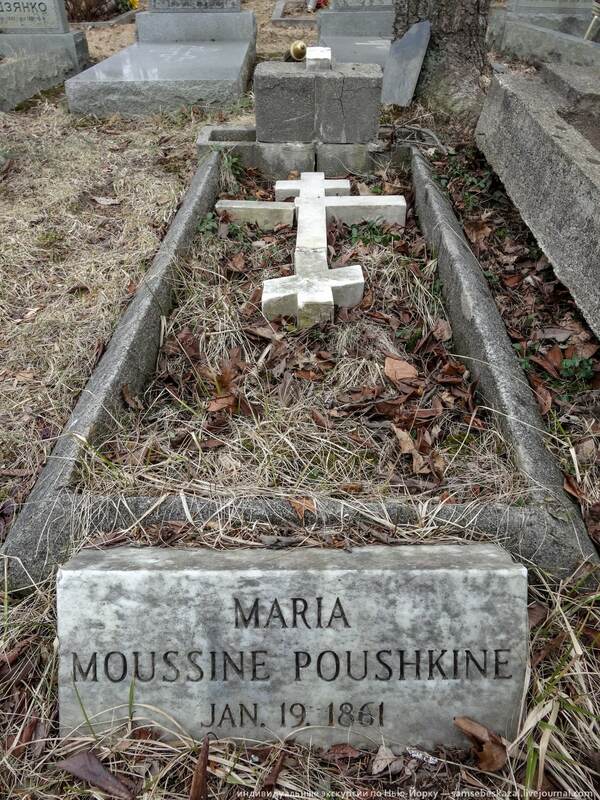 On the grave of Mary Musina-Pushkina cross of old age and fell. To repair the monument to no one and nothing. The monastery has a very modest alms, they, incidentally, can be done via the monastery website on Facebook. Part of the money to bring the cemetery, but this is a small amount. 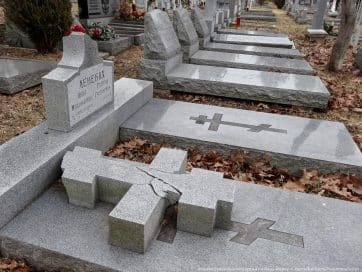 A few years ago the management of the churchyard for a minimal amount and in installments was allowed to bury here four homeless men, immigrants from the former Soviet Union. 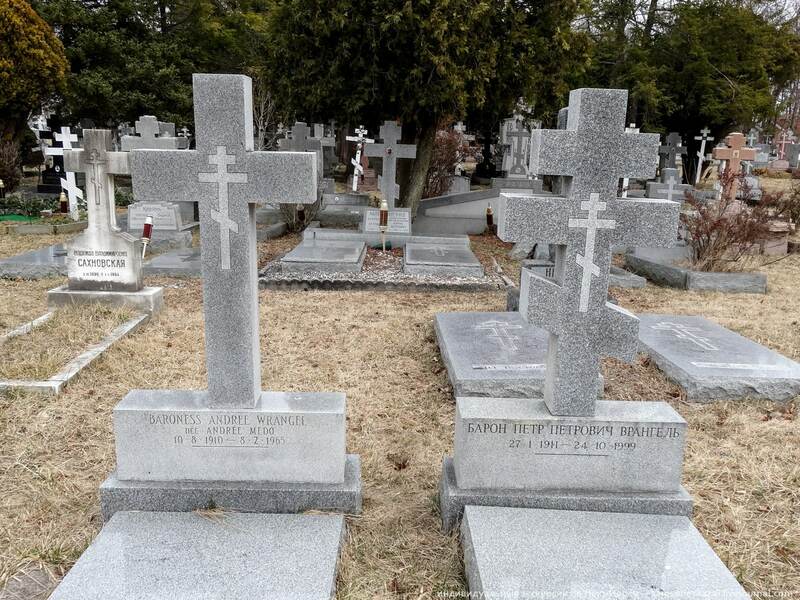 Parishioners of the Orthodox Church in Brighton raised money, have their funeral and be buried here, next to princes and princesses. In General, a commercial vein in the monastery there, which certainly pleases. 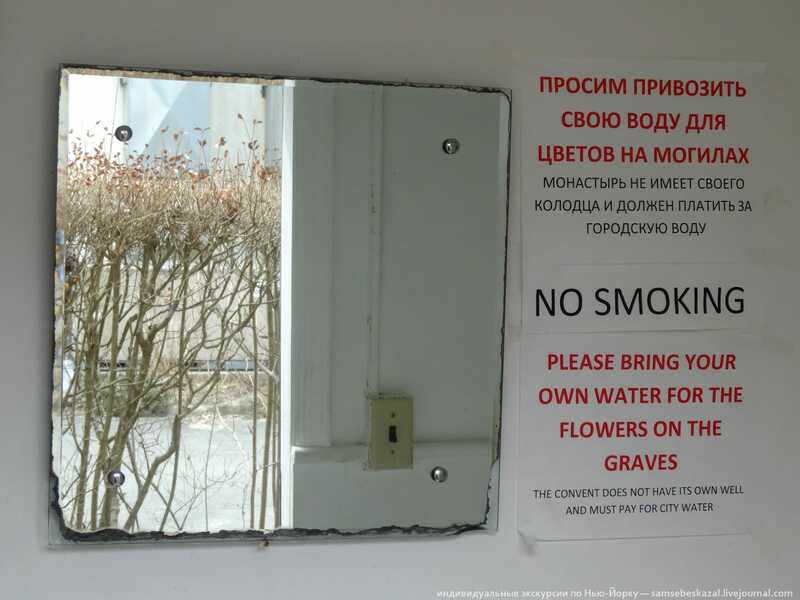 The modern part of the cemetery is not like a Museum. It is more heterogeneous — there is already a completely different audience. 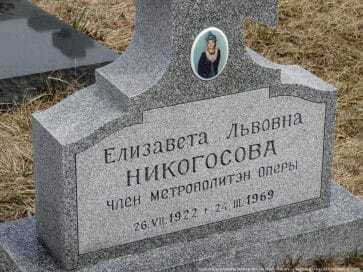 Here, for example, is buried “Phil” from the programme “good night, kids” Igor Galunenko. 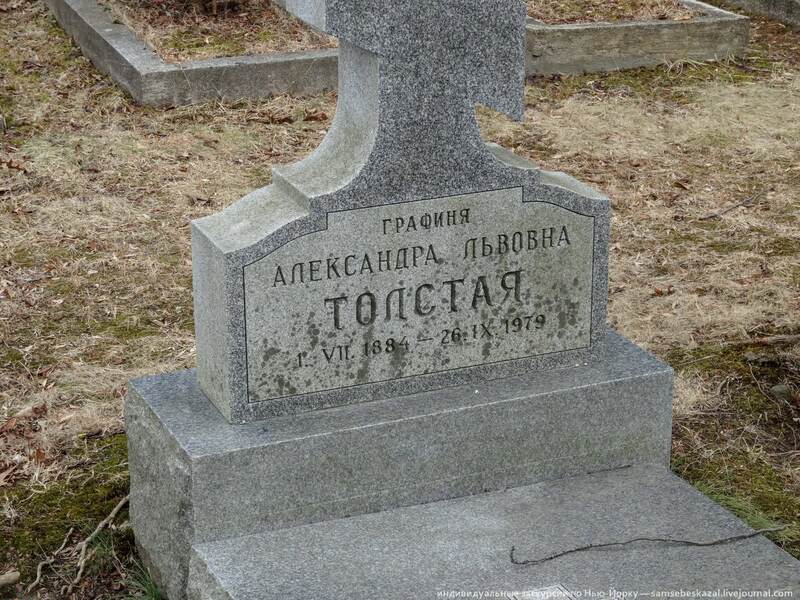 He came to the United States in twenty — was very afraid to get into the army in Russia. He died in late 1993 after falling from the roof of a tall building. In a few hours that I spent in the cemetery, I met not a single other visitor. And one more advice — if you go there, bring water. Your well at a monastery there, for the water they pay from their meagre resources.